Amery Zulfiqar son of Gula Jan, born in 1979 in Kabul, Afghanistan. Zulfiqar hails from Pashtun Musazai tribe. He has completed Said Noor Mohammed Sha Mina High school in 1998. 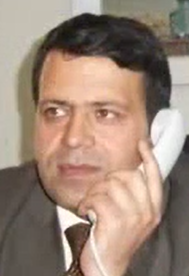 He got his 2 years diploma from the Management and Accounting Institute in 2005 in Kabul City. Zulfiqar was awarded Bachelor degree (BBA) from Bakhtar University in 2012. As per his duty responsibilities as CCO- Chief Credit Officer has played key rule to discovered totally $ 90 Million scandal of Corruption in Pashtany bank. He left Pashtany bank in 3rd October 2013. Now he is living in Canada. Amery Zulfiqar is married and has 5 children. 2. Fundamental financial management and credit operation Course. Implemented by FIC, Strategic Impact Consulting Afghanistan in BMA. 16 Aug 2008- 20 Oct 2008. 5. Accounting and Finance management training workshop held by the ABA to develop the understanding capacity of member banks key staff 18 – 22 July 2007. 6. Basic Economic terms training workshop held by the central bank of Afghanistan Da Afghanistan Bank May 2006 October 2006. 7. Micro Economical basics training conducted by Da Afghanistan Bank central bank of Afghanistan 15 Jan16 April 2005. 8. (AFTS) Afghanistan Fund Transfer system Training workshop with the emphasis on both domestic and international remittances and focus on outlook Express May 2004 15may 2004. 9. (CAMELS) Commercial Banks onside and off side Supervision Training program to safe the public assets and keep the commercial bank in according to the regulatory requirement of Da Afghanistan bank, with Emphasis on Credit analysis Fundamentals of Banking Supervision through direct support of World Bank/ bearing point/ USAID projects and Da Afghanistan bank central bank of Afghanistan as implementer of the said project. Jan 2003-Dec 15/2003. 10. Leadership training certificate, supported by ABA Afghanistan Banks Association held on 26 Jan 2009.